On the eve of the Conquest, the religious system of the inhabitants of central Mexico formed part of a tradition going back thousands of years, shared by many other peoples of Mexico and Mesoamerica. It’s worth noting that many aspects of this system still exist today in ‘indigenous’ communities, even after being converted to Christianity. Before examining the complex world of the gods, we need to stress the extent to which ‘the religious’ entered into the lives of the Mexica. In essence, any activity, from the most important – such as the enthronement of a king – to the most every-day – such as going hunting, had a religious dimension: something grounded in myths, ruled by gods and which demanded appropriate rituals. To understand the role of the gods in Mexica religion, gods that came to dominate a great empire during the 15th and 16th centuries, we should start by familiarising ourselves with how the Mexica perceived the universe. Broadly speaking, the Mexica thought of the earth as a flat surface, either rectangular or round, surrounded by a sea that rose up on the horizon to reach the skies. These were supported by 4 gods – Tlahuizcalpantecuhtli, Xiuhtecuhtli, Quetzalcóatl and Mictlantecuhtli – each associated with a cardinal point: in turn, East, North, West and South (Pic 2). In the vertical dimension of the cosmos, the Mexica believed in the existence of 13 levels of ‘overworld’ and 9 of underworld. Each of these levels was inhabited by gods, stars and other mythological beings. 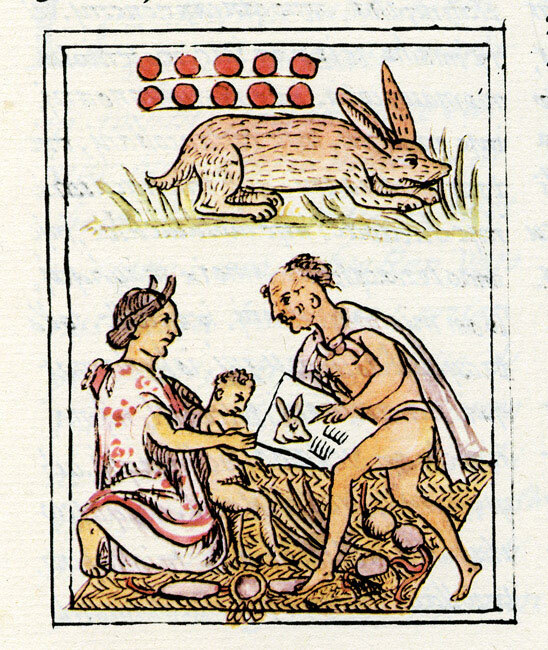 This is illustrated in the Codex Vaticanus-Latinus 3738, where the ‘heavens’ are depicted: the Moon dwelt in the first, Citlalicue ‘She with a skirt of stars’ in the second, Tonatiuh, the Sun, in the third, and so on up to the 13th and highest, Omeyocan, ‘Place of Duality’, home of the original couple, Ometecuhtli and Omecíhuatl (Pic 3). 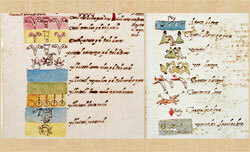 Critically important too were the ways in which the Mexica perceived time. 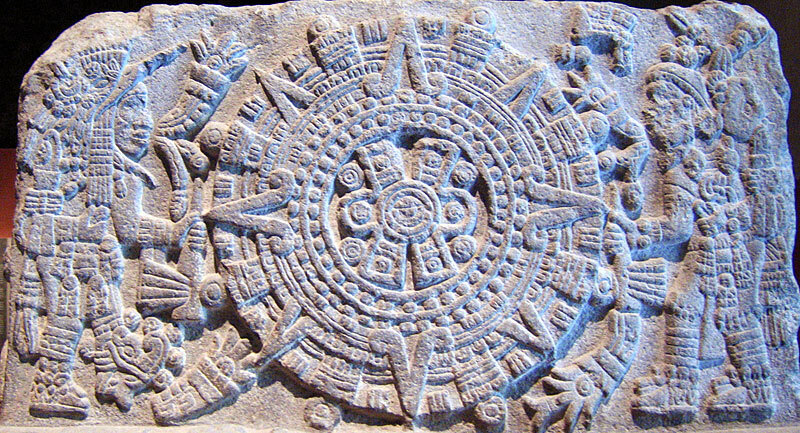 There were basically two calendars: a solar one of 365 days (xiuhpohualli in Náhuatl) made up of 18 ‘months’ of 20 days plus 5 ‘ill-fated’ days; and another ritual one of 260 days (tonalpohualli), formed by combining 20 day signs with 13 numbers. Each month or ‘score’ of twenty days was accompanied by important festivals in the main towns and cities of the Mexica empire. The ritual calendar was used to work out birth dates – which influenced individuals’ characters and fates – and days suitable for certain activities (sowing, harvesting, travelling, hunting, getting married, healing, choosing a king, etc.) (Pic 4). We’ll stick just to some of the stories that tell of the creation of Sky and Earth, the creation of humans, and the ‘Legend of the Suns’. It was the gods born of Ometecuhtli and Omecíhuatl, the first couple, who decided to create Sky and Earth. 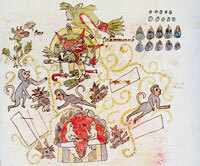 At that time the only existing being was Tlaltéotl, who floated on pristine waters. 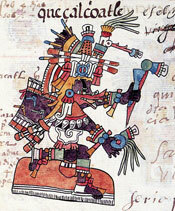 Quetzalcóatl and Tezcatlipoca entered the body of Tlaltéotl and split it into two halves, thus creating Sky and Earth. They erected four pillars to prevent Tlaltéotl from closing shut again (Pic 5). The first couple, furious at the outrage committed, made amends to Tlaltéotl by commanding plants to grow from his body and the blood of sacrificial victims to irrigate it. 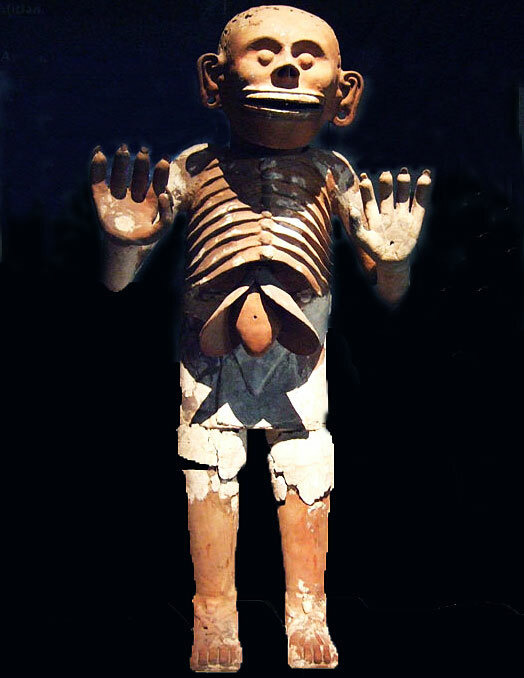 Outstanding among myths that tell of the creation of human beings is the story of how Quetzalcóatl descended to the underworld, where the god Mictlantecuhtli looked after the bones of the giants that had inhabited the previous Age (Pic 6). After completing various tasks, including successfully blowing a conch that Mictlantecuhtli had blocked, Quetzalcóatl rescued the bones and returned with them to the earth’s surface. Unfortunately, however, he tripped on this journey and the bones broke into smaller pieces, the size of human beings. The bones were ground up by the goddess Quilaztli, and Quetzalcóatl pricked himself to spray his blood over them: from this mixture, human beings were born. Other myths tell of the different ages that came before our present world era. The stories that survive speak generally of five eras called Suns. Each era was destroyed by a cataclysm – implicit in the very name of the particular Sun – and the last era, that we live in today, will end with a major earthquake. Some sources indicate what humans were transformed into with each destruction: into fish with the flood, into monkeys with the hurricane, into butterflies, dogs and turkeys with the rain of (volcanic) fire (Pic 7). 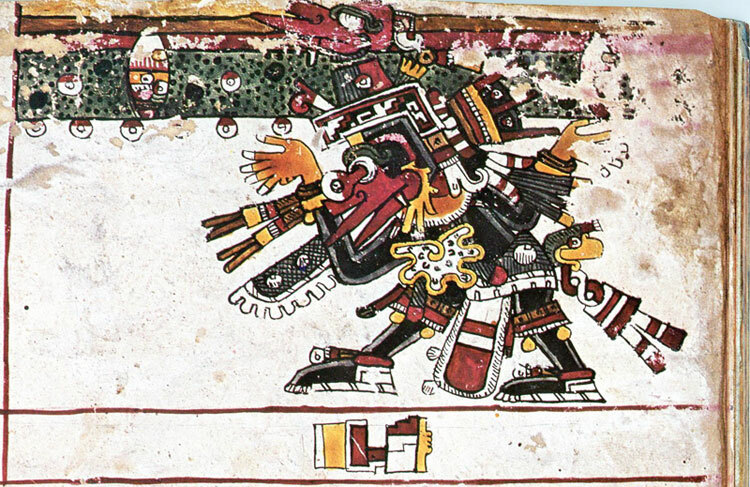 As Michel Graulich has demonstrated, key mythological data point to the fact that Tezcatlipoca and Quetzalcóatl took turns to play the role of Sun. The struggle between these two deities can be seen clearly in the account of the fall of the mythical city of Tollan, in which Quetzalcóatl, Sun of the fourth era, was defeated by Tezcatlipoca. For the Mexica the fifth Sun was naturally ruled by Huitzilopochtli, their tribal god, who has been confused with Tezcatlipoca (Pic 8). It’s not surprising that at the end of the fifth era, with the Conquest, the arrival of the Spanish was seen by the Aztecs as the return of Quetzalcóatl. 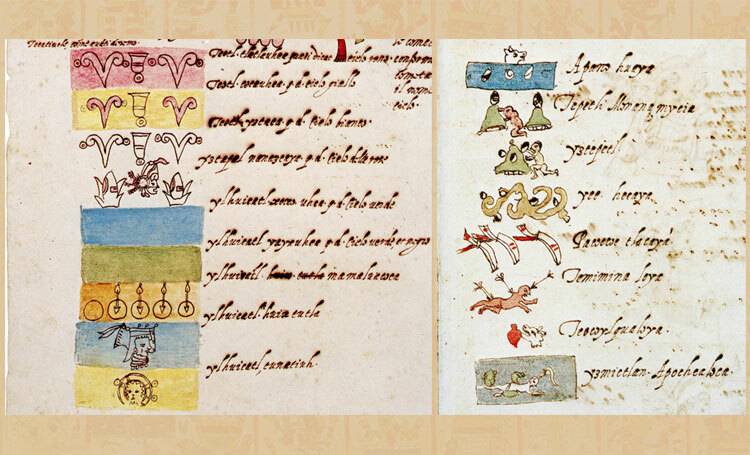 The first Spanish chroniclers were amazed by the sheer number of Mesoamerican gods that they found – no less than 2,000 according to López de Gómara! It proves extremely difficult to summarize the countless faces that the ancient Mexican gods could display. Elements such as water, air, earth and fire; physical spaces such as hills or rivers; natural phenomena such as lightning or rain; animals, plants, and even certain objects such as musical instruments could be gods or receptacles for divine forces. 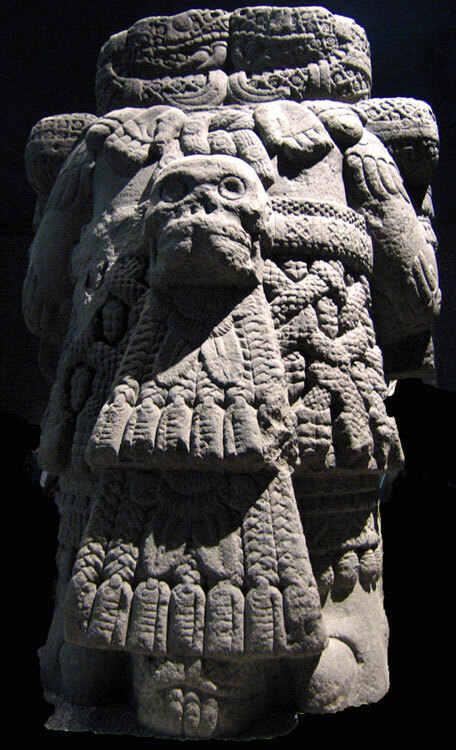 Even some individuals - slaves or war captives, but also priests or leaders ‘possessed’ by a particular deity - could become ixiptla (‘image’ or ‘representative’ in Náhuatl) of the gods in question, whether just on that occasion or for the rest of their lives. 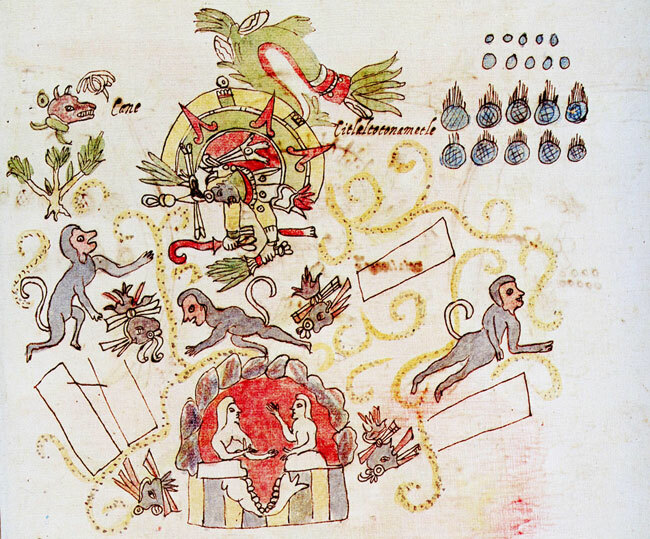 Equally, a god such as Quetzalcóatl – or indeed any deity – could take the form of an element of nature such as air (Pic 9), as a planet (Venus), appear in the guise of an animal (monkey, opossum...), a captive slave (his ‘image’ at Cholula) or a political leader (8-Deer ‘Jaguar-Claw’ in the regional culture of La Mixteca). The ancient Mexicans used statues of wood, clay, stone and even copal incense or rubber to create physical representations of their gods. For example, the Tepictoton, the mountain gods – Popocatépetl, Iztaccíhuatl, Tláloc, Poiauhtécatl, etc. – were represented by figurines made of amaranth seed, eye beans and calabash seeds (Pic 10). 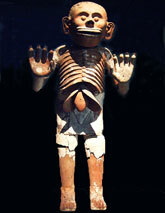 Other objects such as death or sacred bundles (tlaquimilolli) could stand for deities. We know these contained items associated with gods: ashes, mirrors, jade pieces, staffs, fragments of obsidian, arrows etc. (Pic 11). These sacred bundles could identify the particular communities they came from as they contained relics bequeathed to them by their patron god, as a sign of divine choosing. Significantly, these bundles played a key role in royal coronation ceremonies in central Mexico (Pic 12).